Martinez and Velazquez last week allegedly tried to steal mail from this box on Lefferts Boulevard in Richmond Hill. Two men have been charged with “fishing” mail out of blue U.S. Postal Service collection boxes in Richmond Hill and Forest Hills in October and November, Queens District Attorney Richard Brown announced on Friday. Alvaro Martinez, 28, of Manhattan, and Luis Velazquez, 22, of the Bronx, were arraigned Thursday night on three complaints charging them with third-degree burglary, first-degree criminal tampering, third-degree criminal possession of stolen property, first-degree identity theft, and possession of burglar’s tools. Bail for Martinez was set at $25,000; Velazquez’s bail was set at $13,000. As of Wednesday afternoon, neither had posted bail, according to City Department of Correction records. “Mailbox fishing” is a federal crime in which envelopes containing checks and sensitive documents are “fished out” of curbside mailboxes by crooks using a makeshift rod: an adhesive slathered all over a weighted, 16 ounce-20 ounce bottle attached to the end of a string or rope. According to the charging documents, around 4:35 a.m. on Monday, Oct. 29, Velazquez was seen on surveillance footage standing in front of a USPS mailbox at 64th Avenue and 108th Street, and a second box roughly a block away, in Forest Hills. The video allegedly shows Velazquez inserting an object into the mailboxes and pulling it out again along with pieces of mail. According to the complaints, shortly after 4 a.m. on Saturday, Nov. 17, Martinez was observed on surveillance video standing in front of a blue mailbox at 62nd Drive and 108th Street, also in Forest Hills. Martinez allegedly could be seen on camera placing something inside the mailbox and then retrieving that item along with mail attached to it, the complaints noted. And on Wednesday, Nov. 29, Martinez and Velazquez were seen around 3:50 a.m. at the intersection of Lefferts Boulevard and Jamaica Avenue in Richmond Hill, according to the charges. Martinez was allegedly observed with his hands near the opening slot of a mailbox and Velazquez was leaning on the box. As a detective approached, both men moved away from the box, but a shoestring was left dangling from the slot. A member of the U.S. Postal Police opened the box and found the shoestring attached to a juice bottle that was covered with glue. Velazquez allegedly admitted that a nearby vehicle belonged to him and inside that car police recovered dozens of pieces of both unopened and opened mail along with mouse and rat glue traps. The complaints noted that at least one envelope recovered contained a check for $4,000. Mailbox fishing has hit Gotham hard in recent years—especially Queens. The U.S. 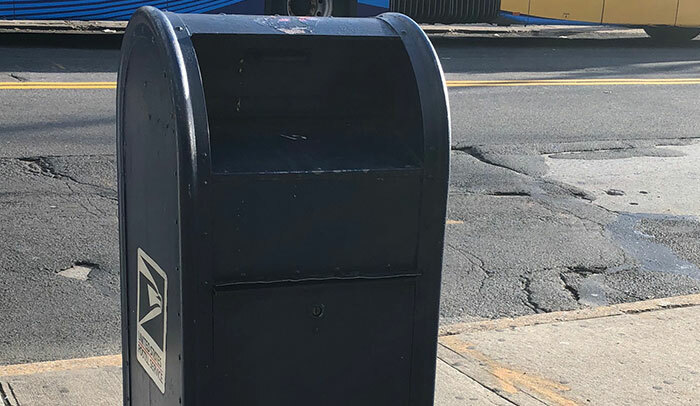 Postal Inspection Service told The Forum on Wednesday that the agency has already replaced approximately 40 percent of the old collection boxes in Queens with new, virtually “fishing-proof” ones. Indeed, since all of the old collection boxes were replaced in the 104th Precinct, USPIS has not recorded a single mailbox fishing complaint in that part of Queens, Harris noted. “We’ve done a lot, but we’ve still got a ways to go,” the spokeswoman added.